Hello and welcome to the 471st installment of the SWD. The recent Syrian Army advances in the eastern countryside of Daraa governorate has changed the reality of travel in the region. Prior to Operation Basalt, if one wanted to travel between Daraa to Suwayda by car, the trip would have taken two hours. Now that al-Hirak has been taken by the government, the road trip lasts only an hour and twenty minutes. Due to the seizure of a primary objective of Operation Basalt, a 12-hour truce has been agreed to. The agreement was brokered by Russia (the primary backer of the Syrian government) and Jordan (the main supporter of the southern rebels). The truce begins at midnight Damascus time, 15 minutes from the publication of this bulletin. Hello and welcome to the 469th installment of the SWD. 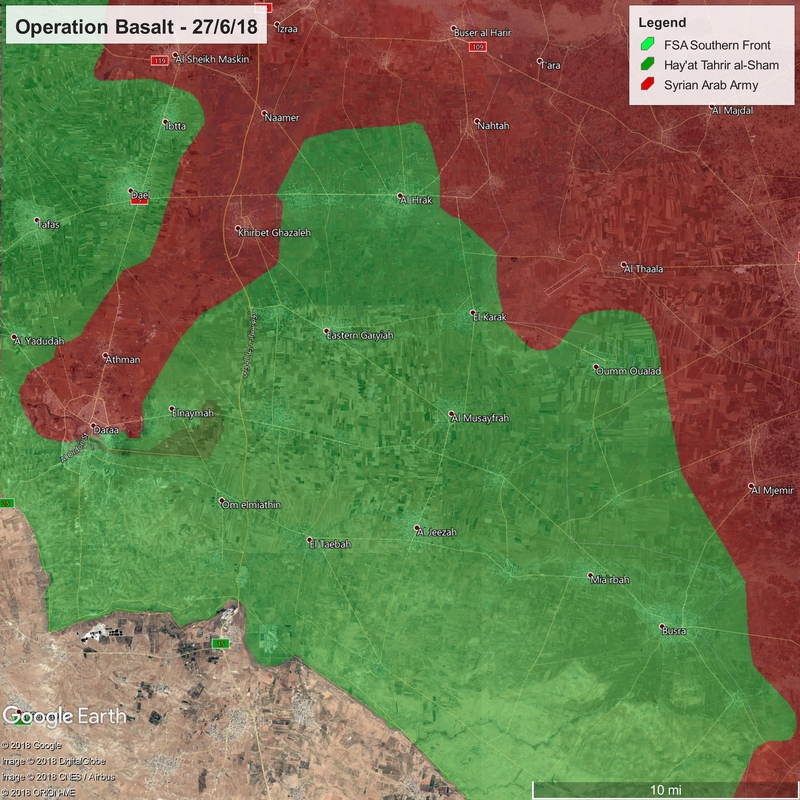 After the capture of the villages of Maliha al-Tash and the town of Nahtah yesterday, the Syrian Army appears to have captured the towns of Mulayhat Sharqiyah and Mulayhat Gharbiyah, east of al-Hirak, although these advances are not entirely confirmed. This advance puts the Army in a position to mount an assault the key rebel stronghold town of al-Hirak. Hello and welcome to the 468th installment of the SWD.